LuitBiz HRM & ESS is a robust and feature rich SaaS HR Software with no download, installation, maintenance or upgrading required. LuitBiz HRM enables all companies to manage their HR process over the cloud without the hassles of maintaining a costly in-house IT infrastructure at an affordable monthly cost. LuitBiz HRM includes rich functionality to support employee, recruitment, training, bonus, HR Forms, attendance and appraisal (both 180 and 360 degree approvals) management plus Employee Self Service (ESS) features. Founded in 2004, Luit Infotech is an India based software company with its registered office in Bangalore. The company is a leading provider of web based SaaS business software. Since its inception, Luit Infotech has served a diverse range of customers from enterprise, education, research and manufacturing sectors and built a substantial market presence with many prestigious installations. LuitBiz HRM's Employee Reimbursements module allows your employees to add business expenses they have incurred using their own money directly into the system. The reimbursement forms are forwarded to the designated approver via LuitBiz HRM. The approver approves / rejects the reimbursement application via ESS and the HR department is notified via HRM to make the payment. The employee can alos attach documental proof for claiming the reimbursement. The Reimbursement module of Luitbiz HRM & ESS greatly simplifies existing paper-based manual reimbursement processes and saves your finance team from spending hours managing employee expense claims. Support for Multiple Companies and Currencies.Anywhere, Anytime Access.Easy-to-use Interface.Holidays, Working & Non Working Days.Employee Events Management.Employee Helpdesk.HR Forms Management. LuitBiz HRM's Employee Payroll module greatly simplifies the generation of payslips that employees can view via their ESS interface. HR users can configure the necessary salary groups and add salary heads to them and generate salary cards fo all employees. Every month employee salary can be paid against these salary cards which also takes into account any bonus or reimbursement that the employee receives during that month automatically. Employees can view their payslips generated via the HR module of LuitBiz in their ESS interface. They will be able to view complete details of the salary they receive with detailed break ups. In case they have any queries, they can post their questions to the HR department via the Helpdesk available in their ESS and can clear their doubts. LuitBiz HRM & ESS cloud based human resource management system and online employee self service that can be used by companies for online human capital management, hr performance management, online performance appraisal, employee training management. employee leave management. employee reimbursement management benefits, employee bonus & employee help desk management. Q. Why is LuitBiz HRM offered in the SaaS Model? 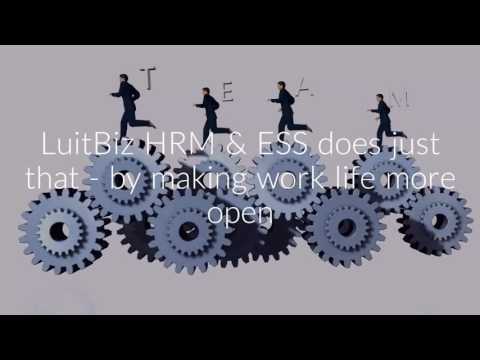 LuitBiz HRM & ESS is available on the SAAS model because it is the only way we can find to keep our software updated over thousands of our customer instances spread across the world. When we roll out and upgrade, we do not ask you to download a version from our website or email you a patch. The patch is rolled out on the central application server, and it is non-disruptive, everyone has the same version of the software and that makes it easy to support. Q. How many user licenses can I buy for LuitBiz HRM & ESS ? You can buy any number of user licenses of LuitBiz HRM & ESS. It all depends on your company's requirements. However, even if you buy one license of ESS, you will have to buy atleast one license of HRM. Thus, to use LuitBiz ESS you need to purchase atleast one license of LuitBiz HRM. Q. What is the number of companies and employees I can register in my LuitBiz HRM? Q. Will my data be safe in LuitBiz HRM ? Q. Will you be able to view my company's data in LuitBiz HRM & ESS?